Yes, I know it’s not lunch. It’s been one of those busy days. So here’s your lunchtime news chum, and then I’m off to eat Pesach leftovers. Oy, do we have leftovers! The Shape of Things. After 17 years, Pepsi bottles are getting a makeover. An easy-to-grip design, youthful packaging and visible brand elements are features of the new look that the company hopes will stand out on shelves. Now if they could just do something about making the product healthier. My Kind of Spice. I hate peppers, especially bell peppers. But I love, absolutely love, horseradish and mustards. Here’s an interesting article about a family that’s in the horseradish business. I thought about making my own horseradish this year, but after reading this article, I’m glad we didn’t find anything but the prepared stuff. Pink Champagne. Pink champagne is completely unrelated to pink lemonaide. It is actually much harder to make and get right than normal champagne. Want to know more about the bubbly drink? This article will tell you all you want to know. Starting from the left take the little fork, it’s the salad fork, then find the bigger fork place and place it to the right of that fork, then we take the plate, it’s a lovely plate, and you place the plate right next to them, line it up, mmmmm, that looks nice, aren’t you having the time of your life, and guess what comes next — you guessed it, the knife, …. ol’ Mo is all a-feared. and Pharaoh was a dad. and the waters, they drew back! as she played the tambourine. Last night was the first night of Passover. It was a busy day.. I’m still exhausted. Still, I promised you pictures of the table, so I need to do that. Of course, there was a complicating factor. There’s always a complicating factor. In this case, the factor was that my wife, two days ago, walked into a plate glass window at Disneyland. Yesterday morning, she was feeling dizzy and unsettled… so around 10am, she had a friend take her to the ER at Valley Presbyterian (on the advice of our family doctor). So all that cooking above… she left written instructions. Now, I’m the table-setter, the leader of the ceremony, and the dish washer (I was up to 1am washing dishes afterwards). So guess who picked up the gauntlet to do the cooking? Nope, not me, although I helped. The credit goes entirely to my daughter Erin, our dear friend Nicole, and my uncle Ron. Erin did a lot: the night before, she backed two pecan pies, two apple pies, and an apple cobbler. Adding to the stress of the day: college selection stuff. As I’ve written before, Erin is deciding between George Washington University in DC, UC Berkeley, and Bard. We had been working with a group that had indicated they could help us get financial aid. We were melting down yesterday because that didn’t pan out. That subject will be the topic of my next post, but suffice it to say that the only aid we’ve seen has been some merit-based aid that Erin got; nothing came from the financial work the college planning group did. Stressing over that just added to things. 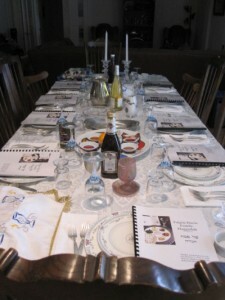 Last night was also the first night using our updated haggadah. I think I worked pretty well. 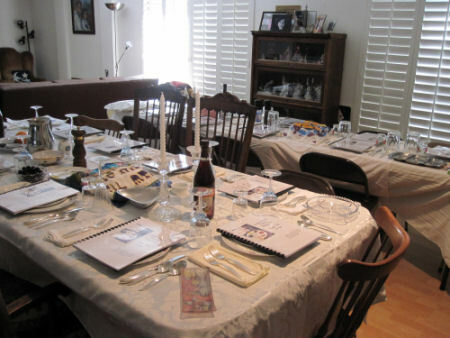 We still have never done the after-dinner portion of the service, but other than that… people liked all the explanations I have in our haggadah, as well as how it tells the story. As before, if you want a copy of the haggadah, all you need to do is drop me an email. One of the nice things about last night is that this is one of the first time we’ve had the full family at the house (or a close facsimile thereof — my wife’s brother couldn’t make it, and her other sister is in Tucson). We had my sister-in-law and her family; my uncle Ron, his daughter, and her three children; my uncle Tom and his wife; three of Tom’s friends, and two of Erin’s friends. A full house! Did Karen ever make it? Yup, she got home around 10pm, after having a temper tantrum at the ER for just letting her sit, with a potential head injury, for 5 hours. She will be letting her doctor know. What was the verdict? Just a minor concussion, and it will get better over the next few days. So that was our 2012 Seder. I was up for 3 hours cleaning, and today I’ve got loads and loads of stuff to put away. Tomorrow may be the Ren Faire if we’re up to it. I’m not sure how Faire is on Easter Sunday, thought. We might go next weekend. As I continue to get the house ready for Pesach (we have 20 people tonight), a quick question (h/t to Larry H on Facebook for the inspiration): Do C programmers start counting the Omer at 0? Therefore, is tonight Omer[-1]? P.S. : The picture of the tables will be coming later today. As a reminder, email me if you want a copy of our haggadah. 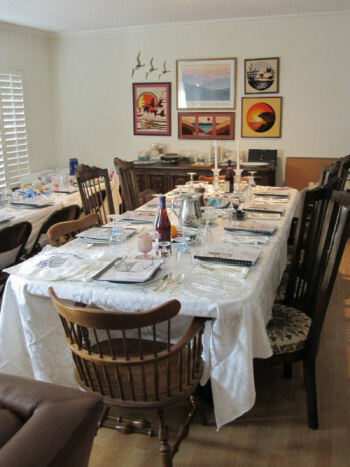 A fascinating article about a Jewish/Japanese-American pre-Seder, held at Keiro Senior Healthcare, the original Boyle Heights home of what became the Los Angeles Jewish Home for the Aged in Reseda. After both the Sedarim, had gone to my waist. Get rid of the turkey, chopped liver and meat. I’ll munch on a carrot or wire shut my own jaw. Ahead of me with another fleshiks meal to fulfill. If I have to cook one more chicken, I think I will riot. So a zisn pesach to you all and to all a good diet! I’ve been known for years and years for the good charoset* I make for the Pesach table. I typically make a large container of it, for it not only serves us for the Pesach table, but we eat it all week for breakfast and the occasional snack. Charoset tends to come out early in the seder (the Pesach service), so folks tend to much on it while waiting for dinner. We’ve switched to a version of the service that puts out a chopped veggie tray early in the service…. but no, they go for the charoset. This year, I noticed as a few folks just chowed down on the charoset that I was getting internally territorial. I was putting out smaller bowls, and we had to refill them even before the dinner started. I know this shouldn’t bother me (after all, it doesn’t bother me with the other stuff we put out for Pesach). I know I can make more whenever I want. Further, I don’t remember the territorial-ness from my childhood — back then, we seemed to get this really weird paste, and no one chowed down. Does anyone else get territorial over the food they make? * for those unfamiliar, charoset (or at least my charoset) is a mix of chopped apples, walnuts, cinnamon, sweet Kosher wine, and chopped dried fruit (this year, raisins and apples, but I’ve used dates and prunes in the past). P.S. : I was going to use my Pastrami picture, but then realized that it might be inappropriate to use a picture of a sandwich during passover. Do I have to sell my userpics containing bread? As Pesach gets closer (just finished making the charoset… and the table is set…. 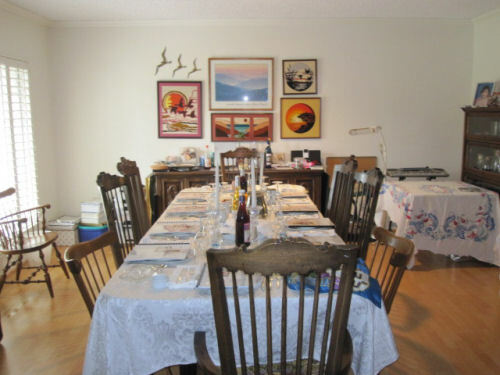 next is filling out the seder plate…. ), I wish you all a happy Passover. P.S. : For another great Passover picture, see this.